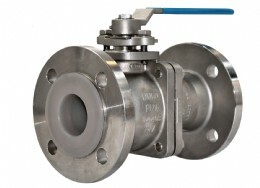 Another New Valve Product “Lined” up in Stock!! Availability, Affordability, Innovation and Performance have always been the key criteria in G.C.Supplies product range, so when the opportunity presented itself to add further value to their already comprehensive portfolio, it was grabbed with both hands. The welcome addition of the CF8M 316 Stainless Steel bodied PFA Lined Ball Valves arrived into stock recently and are available in sizes 1″ - 4″ with both ANSI 150# and DIN PN16 Flanged Ends. The valves are Full Bore with full PFA Lined Body, Ball and Stem with PTFE Seats and Seals and have ISO 5211 Mounting Pads and a Locking Facility as standard.